Consistent programming model across different transaction APIs such as Java Transaction API (JTA), JDBC, Hibernate, Java Persistence API (JPA), and Java Data Objects (JDO). Support for declarative transaction management. Simpler API for programmatic transaction management than complex transaction APIs such as JTA. Excellent integration with Spring's data access abstractions. Advantages of the Spring Framework's transaction support model describes why you would use the Spring Framework's transaction abstraction instead of EJB Container-Managed Transactions (CMT) or choosing to drive local transactions through a proprietary API such as Hibernate. Understanding the Spring Framework transaction abstraction outlines the core classes and describes how to configure and obtain DataSource instances from a variety of sources. Synchronizing resources with transactions describes how the application code ensures that resources are created, reused, and cleaned up properly. Declarative transaction management describes support for declarative transaction management. Programmatic transaction management covers support for programmatic (that is, explicitly coded) transaction management. Traditionally, Java EE developers have had two choices for transaction management: global or local transactions, both of which have profound limitations. Global and local transaction management is reviewed in the next two sections, followed by a discussion of how the Spring Framework's transaction management support addresses the limitations of the global and local transaction models. Global transactions enable you to work with multiple transactional resources, typically relational databases and message queues. The application server manages global transactions through the JTA, which is a cumbersome API to use (partly due to its exception model). Furthermore, a JTA UserTransaction normally needs to be sourced from JNDI, meaning that you also need to use JNDI in order to use JTA. Obviously the use of global transactions would limit any potential reuse of application code, as JTA is normally only available in an application server environment. Previously, the preferred way to use global transactions was via EJB CMT (Container Managed Transaction): CMT is a form of declarative transaction management (as distinguished from programmatic transaction management). EJB CMT removes the need for transaction-related JNDI lookups, although of course the use of EJB itself necessitates the use of JNDI. It removes most but not all of the need to write Java code to control transactions. The significant downside is that CMT is tied to JTA and an application server environment. Also, it is only available if one chooses to implement business logic in EJBs, or at least behind a transactional EJB facade. The negatives of EJB in general are so great that this is not an attractive proposition, especially in the face of compelling alternatives for declarative transaction management. Local transactions are resource-specific, such as a transaction associated with a JDBC connection. Local transactions may be easier to use, but have significant disadvantages: they cannot work across multiple transactional resources. For example, code that manages transactions using a JDBC connection cannot run within a global JTA transaction. Because the application server is not involved in transaction management, it cannot help ensure correctness across multiple resources. (It is worth noting that most applications use a single transaction resource.) Another downside is that local transactions are invasive to the programming model. Spring resolves the disadvantages of global and local transactions. It enables application developers to use a consistent programming model in any environment. You write your code once, and it can benefit from different transaction management strategies in different environments. The Spring Framework provides both declarative and programmatic transaction management. Most users prefer declarative transaction management, which is recommended in most cases. With programmatic transaction management, developers work with the Spring Framework transaction abstraction, which can run over any underlying transaction infrastructure. With the preferred declarative model, developers typically write little or no code related to transaction management, and hence do not depend on the Spring Framework transaction API, or any other transaction API. Do you need an application server for transaction management? The Spring Framework's transaction management support changes traditional rules as to when an enterprise Java application requires an application server. In particular, you do not need an application server simply for declarative transactions through EJBs. In fact, even if your application server has powerful JTA capabilities, you may decide that the Spring Framework's declarative transactions offer more power and a more productive programming model than EJB CMT. Typically you need an application server's JTA capability only if your application needs to handle transactions across multiple resources, which is not a requirement for many applications. Many high-end applications use a single, highly scalable database (such as Oracle RAC) instead. Standalone transaction managers such as Atomikos Transactions and JOTM are other options. Of course, you may need other application server capabilities such as Java Message Service (JMS) and J2EE Connector Architecture (JCA). The Spring Framework gives you the choice of when to scale your application to a fully loaded application server. Gone are the days when the only alternative to using EJB CMT or JTA was to write code with local transactions such as those on JDBC connections, and face a hefty rework if you need that code to run within global, container-managed transactions. With the Spring Framework, only some of the bean definitions in your configuration file, rather than your code, need to change. This is primarily a service provider interface (SPI), although it can be used programmatically from your application code. Because PlatformTransactionManager is an interface, it can be easily mocked or stubbed as necessary. It is not tied to a lookup strategy such as JNDI. PlatformTransactionManager implementations are defined like any other object (or bean) in the Spring Framework IoC container. This benefit alone makes Spring Framework transactions a worthwhile abstraction even when you work with JTA. Transactional code can be tested much more easily than if it used JTA directly. Again in keeping with Spring's philosophy, the TransactionException that can be thrown by any of the PlatformTransactionManager interface's methods is unchecked (that is, it extends the java.lang.RuntimeException class). Transaction infrastructure failures are almost invariably fatal. In rare cases where application code can actually recover from a transaction failure, the application developer can still choose to catch and handle TransactionException. The salient point is that developers are not forced to do so. The getTransaction(..) method returns a TransactionStatus object, depending on a TransactionDefinition parameter. The returned TransactionStatus might represent a new transaction, or can represent an existing transaction if a matching transaction exists in the current call stack. The implication in this latter case is that, as with Java EE transaction contexts, a TransactionStatus is associated with a thread of execution. Isolation: The degree to which this transaction is isolated from the work of other transactions. For example, can this transaction see uncommitted writes from other transactions? Propagation: Typically, all code executed within a transaction scope will run in that transaction. However, you have the option of specifying the behavior in the event that a transactional method is executed when a transaction context already exists. For example, code can continue running in the existing transaction (the common case); or the existing transaction can be suspended and a new transaction created. Spring offers all of the transaction propagation options familiar from EJB CMT. To read about the semantics of transaction propagation in Spring, see Section 11.5.7, “Transaction propagation”. Timeout: How long this transaction runs before timing out and being rolled back automatically by the underlying transaction infrastructure. Read-only status: A read-only transaction can be used when your code reads but does not modify data. Read-only transactions can be a useful optimization in some cases, such as when you are using Hibernate. These settings reflect standard transactional concepts. If necessary, refer to resources that discuss transaction isolation levels and other core transaction concepts. Understanding these concepts is essential to using the Spring Framework or any transaction management solution. Regardless of whether you opt for declarative or programmatic transaction management in Spring, defining the correct PlatformTransactionManager implementation is absolutely essential. You typically define this implementation through dependency injection. The JtaTransactionManager does not need to know about the DataSource, or any other specific resources, because it uses the container's global transaction management infrastructure. The above definition of the dataSource bean uses the <jndi-lookup/> tag from the jee namespace. For more information on schema-based configuration, see Appendix D, XML Schema-based configuration, and for more information on the <jee/> tags see the section entitled Section D.2.3, “The jee schema”. You can also use Hibernate local transactions easily, as shown in the following examples. In this case, you need to define a Hibernate LocalSessionFactoryBean, which your application code will use to obtain Hibernate Session instances. The DataSource bean definition will be similar to the local JDBC example shown previously and thus is not shown in the following example. If the DataSource, used by any non-JTA transaction manager, is looked up via JNDI and managed by a Java EE container, then it should be non-transactional because the Spring Framework, rather than the Java EE container, will manage the transactions. The txManager bean in this case is of the HibernateTransactionManager type. In the same way as the DataSourceTransactionManager needs a reference to the DataSource, the HibernateTransactionManager needs a reference to the SessionFactory. If you are using Hibernate and Java EE container-managed JTA transactions, then you should simply use the same JtaTransactionManager as in the previous JTA example for JDBC. If you use JTA , then your transaction manager definition will look the same regardless of what data access technology you use, be it JDBC, Hibernate JPA or any other supported technology. This is due to the fact that JTA transactions are global transactions, which can enlist any transactional resource. In all these cases, application code does not need to change. You can change how transactions are managed merely by changing configuration, even if that change means moving from local to global transactions or vice versa. It should now be clear how you create different transaction managers, and how they are linked to related resources that need to be synchronized to transactions (for example DataSourceTransactionManager to a JDBC DataSource, HibernateTransactionManager to a Hibernate SessionFactory, and so forth). This section describes how the application code, directly or indirectly using a persistence API such as JDBC, Hibernate, or JDO, ensures that these resources are created, reused, and cleaned up properly. The section also discusses how transaction synchronization is triggered (optionally) through the relevant PlatformTransactionManager. The preferred approach is to use Spring's highest level template based persistence integration APIs or to use native ORM APIs with transaction- aware factory beans or proxies for managing the native resource factories. These transaction-aware solutions internally handle resource creation and reuse, cleanup, optional transaction synchronization of the resources, and exception mapping. Thus user data access code does not have to address these tasks, but can be focused purely on non-boilerplate persistence logic. Generally, you use the native ORM API or take a template approach for JDBC access by using the JdbcTemplate. These solutions are detailed in subsequent chapters of this reference documentation. Classes such as DataSourceUtils (for JDBC), EntityManagerFactoryUtils (for JPA), SessionFactoryUtils (for Hibernate), PersistenceManagerFactoryUtils (for JDO), and so on exist at a lower level. When you want the application code to deal directly with the resource types of the native persistence APIs, you use these classes to ensure that proper Spring Framework-managed instances are obtained, transactions are (optionally) synchronized, and exceptions that occur in the process are properly mapped to a consistent API. If an existing transaction already has a connection synchronized (linked) to it, that instance is returned. Otherwise, the method call triggers the creation of a new connection, which is (optionally) synchronized to any existing transaction, and made available for subsequent reuse in that same transaction. As mentioned, any SQLException is wrapped in a Spring Framework CannotGetJdbcConnectionException, one of the Spring Framework's hierarchy of unchecked DataAccessExceptions. This approach gives you more information than can be obtained easily from the SQLException, and ensures portability across databases, even across different persistence technologies. This approach also works without Spring transaction management (transaction synchronization is optional), so you can use it whether or not you are using Spring for transaction management. Of course, once you have used Spring's JDBC support, JPA support or Hibernate support, you will generally prefer not to use DataSourceUtils or the other helper classes, because you will be much happier working through the Spring abstraction than directly with the relevant APIs. For example, if you use the Spring JdbcTemplate or jdbc.object package to simplify your use of JDBC, correct connection retrieval occurs behind the scenes and you won't need to write any special code. At the very lowest level exists the TransactionAwareDataSourceProxy class. This is a proxy for a target DataSource, which wraps the target DataSource to add awareness of Spring-managed transactions. In this respect, it is similar to a transactional JNDI DataSource as provided by a Java EE server. It should almost never be necessary or desirable to use this class, except when existing code must be called and passed a standard JDBC DataSource interface implementation. In that case, it is possible that this code is usable, but participating in Spring managed transactions. It is preferable to write your new code by using the higher level abstractions mentioned above. Most Spring Framework users choose declarative transaction management. This option has the least impact on application code, and hence is most consistent with the ideals of a non-invasive lightweight container. The Spring Framework's declarative transaction management is made possible with Spring aspect-oriented programming (AOP), although, as the transactional aspects code comes with the Spring Framework distribution and may be used in a boilerplate fashion, AOP concepts do not generally have to be understood to make effective use of this code. Unlike EJB CMT, which is tied to JTA, the Spring Framework's declarative transaction management works in any environment. It can work with JTA transactions or local transactions using JDBC, JPA, Hibernate or JDO by simply adjusting the configuration files. You can apply the Spring Framework declarative transaction management to any class, not merely special classes such as EJBs. The Spring Framework offers declarative rollback rules, a feature with no EJB equivalent. Both programmatic and declarative support for rollback rules is provided. The Spring Framework enables you to customize transactional behavior, by using AOP. For example, you can insert custom behavior in the case of transaction rollback. You can also add arbitrary advice, along with the transactional advice. With EJB CMT, you cannot influence the container's transaction management except with setRollbackOnly(). The pre-Spring 2.0 configuration style is still 100% valid configuration; think of the new <tx:tags/> as simply defining TransactionProxyFactoryBean beans on your behalf. The concept of rollback rules is important: they enable you to specify which exceptions (and throwables) should cause automatic rollback. You specify this declaratively, in configuration, not in Java code. So, although you can still call setRollbackOnly()on the TransactionStatus object to roll back the current transaction back, most often you can specify a rule that MyApplicationException must always result in rollback. The significant advantage to this option is that business objects do not depend on the transaction infrastructure. For example, they typically do not need to import Spring transaction APIs or other Spring APIs. Although EJB container default behavior automatically rolls back the transaction on a system exception (usually a runtime exception), EJB CMT does not roll back the transaction automatically on an application exception (that is, a checked exception other than java.rmi.RemoteException). While the Spring default behavior for declarative transaction management follows EJB convention (roll back is automatic only on unchecked exceptions), it is often useful to customize this behavior. It is not sufficient to tell you simply to annotate your classes with the @Transactional annotation, add the line (<tx:annotation-driven/>) to your configuration, and then expect you to understand how it all works. This section explains the inner workings of the Spring Framework's declarative transaction infrastructure in the event of transaction-related issues. Spring AOP is covered in Chapter 8, Aspect Oriented Programming with Spring. Consider the following interface, and its attendant implementation. This example uses Foo and Bar classes as placeholders so that you can concentrate on the transaction usage without focusing on a particular domain model. For the purposes of this example, the fact that the DefaultFooService class throws UnsupportedOperationException instances in the body of each implemented method is good; it allows you to see transactions created and then rolled back in response to the UnsupportedOperationException instance. Assume that the first two methods of the FooService interface, getFoo(String) and getFoo(String, String), must execute in the context of a transaction with read-only semantics, and that the other methods,insertFoo(Foo) and updateFoo(Foo), must execute in the context of a transaction with read-write semantics. The following configuration is explained in detail in the next few paragraphs. Examine the preceding configuration. You want to make a service object, the fooService bean, transactional. The transaction semantics to apply are encapsulated in the <tx:advice/> definition. The <tx:advice/> definition reads as “... all methods on starting with 'get' are to execute in the context of a read-only transaction, and all other methods are to execute with the default transaction semantics”. The transaction-manager attribute of the <tx:advice/> tag is set to the name of the PlatformTransactionManager bean that is going to drive the transactions, in this case, the txManager bean. You can omit the transaction-manager attribute in the transactional advice (<tx:advice/>) if the bean name of the PlatformTransactionManager that you want to wire in has the name transactionManager. If the PlatformTransactionManager bean that you want to wire in has any other name, then you must use the transaction-manager attribute explicitly, as in the preceding example. The <aop:config/> definition ensures that the transactional advice defined by the txAdvice bean executes at the appropriate points in the program. First you define a pointcut that matches the execution of any operation defined in the FooService interface (fooServiceOperation). Then you associate the pointcut with the txAdvice using an advisor. The result indicates that at the execution of a fooServiceOperation, the advice defined by txAdvice will be run. The expression defined within the <aop:pointcut/> element is an AspectJ pointcut expression; see Chapter 8, Aspect Oriented Programming with Spring for more details on pointcut expressions in Spring 2.0. In this example it is assumed that all your service interfaces are defined in the x.y.service package; see Chapter 8, Aspect Oriented Programming with Spring for more details. The previous section outlined the basics of how to specify transactional settings for classes, typically service layer classes, declaratively in your application. This section describes how you can control the rollback of transactions in a simple declarative fashion. The recommended way to indicate to the Spring Framework's transaction infrastructure that a transaction's work is to be rolled back is to throw an Exception from code that is currently executing in the context of a transaction. The Spring Framework's transaction infrastructure code will catch any unhandled Exception as it bubbles up the call stack, and make a determination whether to mark the transaction for rollback. In its default configuration, the Spring Framework's transaction infrastructure code only marks a transaction for rollback in the case of runtime, unchecked exceptions; that is, when the thrown exception is an instance or subclass of RuntimeException. (Errors will also - by default - result in a rollback). Checked exceptions that are thrown from a transactional method do not result in rollback in the default configuration. You can configure exactly which Exception types mark a transaction for rollback, including checked exceptions. The following XML snippet demonstrates how you configure rollback for a checked, application-specific Exception type. You can also specify 'no rollback rules', if you do not want a transaction rolled back when an exception is thrown. The following example tells the Spring Framework's transaction infrastructure to commit the attendant transaction even in the face of an unhandled InstrumentNotFoundException. When the Spring Framework's transaction infrastructure catches an exception and is consults configured rollback rules to determine whether to mark the transaction for rollback, the strongest matching rule wins. So in the case of the following configuration, any exception other than an InstrumentNotFoundException results in a rollback of the attendant transaction. You are strongly encouraged to use the declarative approach to rollback if at all possible. Programmatic rollback is available should you absolutely need it, but its usage flies in the face of achieving a clean POJO-based architecture. Consider the scenario where you have a number of service layer objects, and you want to apply a totally different transactional configuration to each of them. You do this by defining distinct <aop:advisor/> elements with differing pointcut and advice-ref attribute values. The following example shows how to configure two distinct beans with totally different transactional settings. Transaction timeout defaults to the default timeout of the underlying transaction system, or none if timeouts are not supported. Any RuntimeException triggers rollback, and any checked Exception does not. Method name(s) with which the transaction attributes are to be associated. The wildcard (*) character can be used to associate the same transaction attribute settings with a number of methods; for example, get*, handle*, on*Event, and so forth. propagation No REQUIRED Transaction propagation behavior. isolation No DEFAULT Transaction isolation level. timeout No -1 Transaction timeout value (in seconds). Exception(s) that trigger rollback; comma-delimited. For example, com.foo.MyBusinessException,ServletException. Exception(s) that do not trigger rollback; comma-delimited. For example, com.foo.MyBusinessException,ServletException. In addition to the XML-based declarative approach to transaction configuration, you can use an annotation-based approach. Declaring transaction semantics directly in the Java source code puts the declarations much closer to the affected code. There is not much danger of undue coupling, because code that is meant to be used transactionally is almost always deployed that way anyway. You can omit the transaction-manager attribute in the <tx:annotation-driven/> tag if the bean name of the PlatformTransactionManager that you want to wire in has the name transactionManager. If the PlatformTransactionManager bean that you want to dependency-inject has any other name, then you have to use the transaction-manager attribute explicitly, as in the preceding example. You can place the @Transactional annotation before an interface definition, a method on an interface, a class definition, or a public method on a class. However, the mere presence of the @Transactional annotation is not enough to activate the transactional behavior. The @Transactional annotation is simply metadata that can be consumed by some runtime infrastructure that is @Transactional-aware and that can use the metadata to configure the appropriate beans with transactional behavior. In the preceding example, the <tx:annotation-driven/> element switches on the transactional behavior. Spring recommends that you only annotate concrete classes (and methods of concrete classes) with the @Transactional annotation, as opposed to annotating interfaces. You certainly can place the @Transactional annotation on an interface (or an interface method), but this works only as you would expect it to if you are using interface-based proxies. The fact that Java annotations are not inherited from interfaces means that if you are using class-based proxies (proxy-target-class="true") or the weaving-based aspect (mode="aspectj"), then the transaction settings are not recognized by the proxying and weaving infrastructure, and the object will not be wrapped in a transactional proxy, which would be decidedly bad. In proxy mode (which is the default), only external method calls coming in through the proxy are intercepted. This means that self-invocation, in effect, a method within the target object calling another method of the target object, will not lead to an actual transaction at runtime even if the invoked method is marked with @Transactional. Consider the use of AspectJ mode (see mode attribute in table below) if you expect self-invocations to be wrapped with transactions as well. In this case, there will not be a proxy in the first place; instead, the target class will be weaved (that is, its byte code will be modified) in order to turn @Transactional into runtime behavior on any kind of method. Name of transaction manager to use. Only required if the name of the transaction manager is not transactionManager, as in the example above. Defines the order of the transaction advice that is applied to beans annotated with @Transactional. (For more information about the rules related to ordering of AOP advice, see Section 8.2.4.7, “Advice ordering”.) 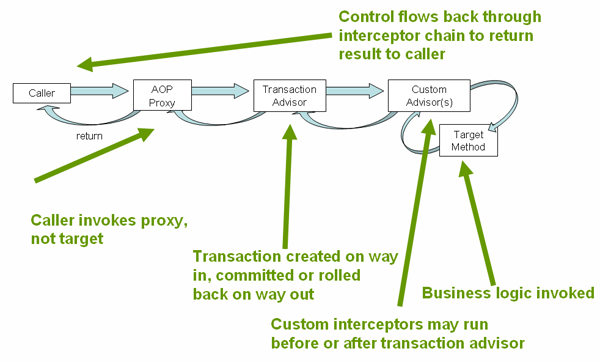 No specified ordering means that the AOP subsystem determines the order of the advice. <tx:annotation-driven/> only looks for @Transactional on beans in the same application context it is defined in. This means that, if you put <tx:annotation-driven/> in a WebApplicationContext for a DispatcherServlet, it only checks for @Transactional beans in your controllers, and not your services. See Section 16.2, “The DispatcherServlet” for more information. Transaction timeout defaults to the default timeout of the underlying transaction system, or to none if timeouts are not supported. value String Optional qualifier specifying the transaction manager to be used. propagation enum: Propagation Optional propagation setting. isolation enum: Isolation Optional isolation level. timeout int (in seconds granularity) Transaction timeout. rollbackFor Array of Class objects, which must be derived from Throwable. Optional array of exception classes that must cause rollback. rollbackForClassname Array of class names. Classes must be derived from Throwable. Optional array of names of exception classes that must cause rollback. noRollbackFor Array of Class objects, which must be derived from Throwable. Optional array of exception classes that must not cause rollback. noRollbackForClassname Array of String class names, which must be derived from Throwable. Optional array of names of exception classes that must not cause rollback. Currently you cannot have explicit control over the name of a transaction, where 'name' means the transaction name that will be shown in a transaction monitor, if applicable (for example, WebLogic's transaction monitor), and in logging output. For declarative transactions, the transaction name is always the fully-qualified class name + "." + method name of the transactionally-advised class. For example, if the handlePayment(..) method of the BusinessService class started a transaction, the name of the transaction would be: com.foo.BusinessService.handlePayment. could be combined with the following transaction manager bean declarations in the application context. In this case, the two methods on TransactionalService will run under separate transaction managers, differentiated by the "order" and "account" qualifiers. The default <tx:annotation-driven> target bean name transactionManager will still be used if no specifically qualified PlatformTransactionManager bean is found. Here we have used the syntax to define the transaction manager qualifier, but could also have included propagation behavior, rollback rules, timeouts etc. This section describes some semantics of transaction propagation in Spring. Please note that this section is not an introduction to transaction propagation proper; rather it details some of the semantics regarding transaction propagation in Spring. In Spring-managed transactions, be aware of the difference between physical and logical transactions, and how the propagation setting applies to this difference. When the propagation setting is PROPAGATION_REQUIRED, a logical transaction scope is created for each method upon which the setting is applied. Each such logical transaction scope can determine rollback-only status individually, with an outer transaction scope being logically independent from the inner transaction scope. Of course, in case of standard PROPAGATION_REQUIRED behavior, all these scopes will be mapped to the same physical transaction. So a rollback-only marker set in the inner transaction scope does affect the outer transaction's chance to actually commit (as you would expect it to). However, in the case where an inner transaction scope sets the rollback-only marker, the outer transaction has not decided on the rollback itself, and so the rollback (silently triggered by the inner transaction scope) is unexpected. A corresponding UnexpectedRollbackException is thrown at that point. This is expected behavior so that the caller of a transaction can never be misled to assume that a commit was performed when it really was not. So if an inner transaction (of which the outer caller is not aware) silently marks a transaction as rollback-only, the outer caller still calls commit. The outer caller needs to receive an UnexpectedRollbackException to indicate clearly that a rollback was performed instead. PROPAGATION_REQUIRES_NEW, in contrast to PROPAGATION_REQUIRED, uses a completely independent transaction for each affected transaction scope. In that case, the underlying physical transactions are different and hence can commit or roll back independently, with an outer transaction not affected by an inner transaction's rollback status. PROPAGATION_NESTED uses a single physical transaction with multiple savepoints that it can roll back to. Such partial rollbacks allow an inner transaction scope to trigger a rollback for its scope, with the outer transaction being able to continue the physical transaction despite some operations having been rolled back. This setting is typically mapped onto JDBC savepoints, so will only work with JDBC resource transactions. See Spring's DataSourceTransactionManager. Suppose you want to execute both transactional and some basic profiling advice. How do you effect this in the context of <tx:annotation-driven/>? Configured profiling aspect starts up. Method on the advised object executes. Profiling aspect reports exact duration of the whole transactional method invocation. This chapter is not concerned with explaining AOP in any great detail (except as it applies to transactions). See Chapter 8, Aspect Oriented Programming with Spring for detailed coverage of the following AOP configuration and AOP in general. Here is the code for a simple profiling aspect discussed above. The ordering of advice is controlled through the Ordered interface. For full details on advice ordering, see Section 8.2.4.7, “Advice ordering”. The result of the above configuration is a fooService bean that has profiling and transactional aspects applied to it in the desired order. You configure any number of additional aspects in similar fashion. The following example effects the same setup as above, but uses the purely XML declarative approach. The result of the above configuration will be a fooService bean that has profiling and transactional aspects applied to it in that order. If you want the profiling advice to execute after the transactional advice on the way in, and before the transactional advice on the way out, then you simply swap the value of the profiling aspect bean's order property so that it is higher than the transactional advice's order value. You configure additional aspects in similar fashion. It is also possible to use the Spring Framework's @Transactional support outside of a Spring container by means of an AspectJ aspect. To do so, you first annotate your classes (and optionally your classes' methods) with the @Transactional annotation, and then you link (weave) your application with the org.springframework.transaction.aspectj.AnnotationTransactionAspect defined in the spring-aspects.jar file. The aspect must also be configured with a transaction manager. You can of course use the Spring Framework's IoC container to take care of dependency-injecting the aspect. The simplest way to configure the transaction management aspect is to use the <tx:annotation-driven/> element and specify the mode attribute to aspectj as described in Section 11.5.6, “Using @Transactional”. Because we're focusing here on applications running outside of a Spring container, we'll show you how to do it programmatically. Prior to continuing, you may want to read Section 11.5.6, “Using @Transactional” and Chapter 8, Aspect Oriented Programming with Spring respectively. To weave your applications with the AnnotationTransactionAspect you must either build your application with AspectJ (see the AspectJ Development Guide) or use load-time weaving. See Section 8.8.4, “Load-time weaving with AspectJ in the Spring Framework” for a discussion of load-time weaving with AspectJ. Using a PlatformTransactionManager implementation directly. The Spring team generally recommends the TransactionTemplate for programmatic transaction management. The second approach is similar to using the JTA UserTransaction API, although exception handling is less cumbersome. The TransactionTemplate adopts the same approach as other Spring templates such as the JdbcTemplate. It uses a callback approach, to free application code from having to do the boilerplate acquisition and release of transactional resources, and results in code that is intention driven, in that the code that is written focuses solely on what the developer wants to do. As you will see in the examples that follow, using the TransactionTemplate absolutely couples you to Spring's transaction infrastructure and APIs. Whether or not programmatic transaction management is suitable for your development needs is a decision that you will have to make yourself. Application code that must execute in a transactional context, and that will use the TransactionTemplate explicitly, looks like the following. You, as an application developer, write a TransactionCallback implementation (typically expressed as an anonymous inner class) that contains the code that you need to execute in the context of a transaction. You then pass an instance of your custom TransactionCallback to the execute(..) method exposed on the TransactionTemplate. The following example defines a TransactionTemplate with some custom transactional settings, using Spring XML configuration. The sharedTransactionTemplate can then be injected into as many services as are required. Finally, instances of the TransactionTemplate class are threadsafe, in that instances do not maintain any conversational state. TransactionTemplate instances do however maintain configuration state, so while a number of classes may share a single instance of a TransactionTemplate, if a class needs to use a TransactionTemplate with different settings (for example, a different isolation level), then you need to create two distinct TransactionTemplate instances. You can also use the org.springframework.transaction.PlatformTransactionManager directly to manage your transaction. Simply pass the implementation of the PlatformTransactionManager you are using to your bean through a bean reference. Then, using the TransactionDefinition and TransactionStatus objects you can initiate transactions, roll back, and commit. Programmatic transaction management is usually a good idea only if you have a small number of transactional operations. For example, if you have a web application that require transactions only for certain update operations, you may not want to set up transactional proxies using Spring or any other technology. In this case, using the TransactionTemplate may be a good approach. Being able to set the transaction name explicitly is also something that can only be done using the programmatic approach to transaction management. On the other hand, if your application has numerous transactional operations, declarative transaction management is usually worthwhile. It keeps transaction management out of business logic, and is not difficult to configure. When using the Spring Framework, rather than EJB CMT, the configuration cost of declarative transaction management is greatly reduced. Spring's transaction abstraction generally is application server agnostic. Additionally, Spring's JtaTransactionManager class, which can optionally perform a JNDI lookup for the JTA UserTransaction and TransactionManager objects, autodetects the location for the latter object, which varies by application server. Having access to the JTA TransactionManager allows for enhanced transaction semantics, in particular supporting transaction suspension. See the JtaTransactionManager Javadocs for details. Spring's JtaTransactionManager is the standard choice to run on Java EE application servers, and is known to work on all common servers. Advanced functionality such as transaction suspension works on many servers as well -- including GlassFish, JBoss, Geronimo, and Oracle OC4J -- without any special configuration required. However, for fully supported transaction suspension and further advanced integration, Spring ships special adapters for IBM WebSphere, BEA WebLogic Server, and Oracle OC4J. These adapters are discussed in the following sections. For standard scenarios, including WebLogic Server, WebSphere and OC4J, consider using the convenient <tx:jta-transaction-manager/> configuration element. When configured, this element automatically detects the underlying server and chooses the best transaction manager available for the platform. This means that you won't have to configure server-specific adapter classes (as discussed in the following sections) explicitly; rather, they are chosen automatically, with the standard JtaTransactionManager as default fallback. On WebSphere 6.1.0.9 and above, the recommended Spring JTA transaction manager to use is WebSphereUowTransactionManager. This special adapter leverages IBM's UOWManager API, which is available in WebSphere Application Server 6.0.2.19 and later and 6.1.0.9 and later. With this adapter, Spring-driven transaction suspension (suspend/resume as initiated by PROPAGATION_REQUIRES_NEW) is officially supported by IBM! On WebLogic Server 9.0 or above, you typically would use the WebLogicJtaTransactionManager instead of the stock JtaTransactionManager class. This special WebLogic-specific subclass of the normal JtaTransactionManager supports the full power of Spring's transaction definitions in a WebLogic-managed transaction environment, beyond standard JTA semantics: Features include transaction names, per-transaction isolation levels, and proper resuming of transactions in all cases. Spring ships a special adapter class for OC4J 10.1.3 or later called OC4JJtaTransactionManager. This class is analogous to the WebLogicJtaTransactionManager class discussed in the previous section, providing similar value-adds on OC4J: transaction names and per-transaction isolation levels. The full JTA functionality, including transaction suspension, works fine with Spring's JtaTransactionManager on OC4J as well. The special OC4JJtaTransactionManager adapter simply provides value-adds beyond standard JTA. Use the correct PlatformTransactionManager implementation based on your choice of transactional technologies and requirements. Used properly, the Spring Framework merely provides a straightforward and portable abstraction. If you are using global transactions, you must use the org.springframework.transaction.jta.JtaTransactionManager class (or an application server-specific subclass of it) for all your transactional operations. Otherwise the transaction infrastructure attempts to perform local transactions on resources such as container DataSource instances. Such local transactions do not make sense, and a good application server treats them as errors. Distributed transactions in Spring, with and without XA is a JavaWorld presentation in which SpringSource's David Syer guides you through seven patterns for distributed transactions in Spring applications, three of them with XA and four without. Java Transaction Design Strategies is a book available from InfoQ that provides a well-paced introduction to transactions in Java. It also includes side-by-side examples of how to configure and use transactions with both the Spring Framework and EJB3.